Living conditions inside detention and open centres have been improving constantly over the past years. 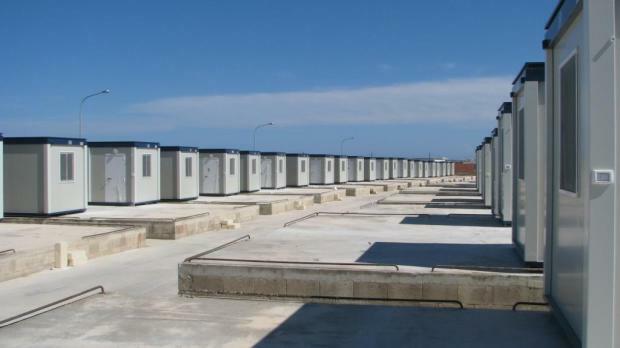 These new pre-fabricated homes were recently installed at the Ħal Far Open Centre, replacing tents. A report by the International Commission of Jurists on detention in Malta is warped and unrealistic, the Home Affairs Ministry said. The report "Not here to stay", was published yesterday and is based on the commission's visit to Malta in September last year. The ministry said it was not agreement with the report and the country's detention policy was to be retained in its present form. Whereas the ministry appreciated the fact that the commission recognised, albeit very late in the day, that Malta was exposed to disproportionate migratory influxes and that it requires assistance from the European Union, the report was not accurate in its portrayal of the Maltese scenario. "In the first place, the ministry considers that Malta's detention policy is not only fully in line with the country's international obligations, but also that it is wholly justified in the present circumstances. "The scope of detention is not punitive in scope, as its aim is primarily to safeguard national security. It is to be borne in mind that the overwhelming majority or irregular migrants reaching the country do so undocumented, as well as in disproportionately high numbers, as recognised by the International Commission itself." The European Convention on Human Rights, the ministry said, did not condemn mandatory detention, which was permitted to prevent unauthorised entry into the country, as well as for removal or irregularly staying persons. Detained persons were provided with information concerning their rights, including the right to challenge their detention and the right to apply for asylum. Thanks to the considerable improvements implemented by the Office of the Refugee Commissioner to speed up the asylum determination process, the average length of time taken to process such claims dropped to between three and six months and the vast majority of people eligible for protection by Malta only spend a few weeks in administrative detention. "It is only failed asylum seekers who are detained for a longer period, during which time the Maltese authorities strive to repatriate them back to their country of origin... Such repatriation operations would be made considerably more difficult in the absence of an administrative detention system and increase the risk of these persons absconding from Malta or going underground. This system is thus fair and just with the persons who are repatriated." The ministry said it was, likewise, not in agreement with the commission's conclusions on the Immigration Appeals Board, a judicial authority enjoying independence at law. During the riot at the Safi Detention Centre August 16, last year, the ministry said, only one migrant received minor injuries, which showed that the authorities did not employ excessive force. "In the light of these circumstances the International Commission's call for an inquiry into this incident, vis-à-vis the use of force by the authorities almost a year after it took place is uncalled for. * Having an asylum recognition rate at first instance consistently exceeding 50% in recognition of the situation of asylum claimants in Malta." The ministry said it considered that these efforts should have been given more weight by the commission in its assessment of the migration and asylum situation in Malta. "Whilst the ministry recognises that more remains to be done, it certainly cannot be argued that Malta is not doing enough or that it is in any way ignoring the rights of irregular migrants or asylum seekers," it said.